It's often been said that "If it looks like a duck and quacks like a duck, then it must be a duck." Using that same reasoning, it would seem logical to conclude that if it looks like a German beer stein and is labeled "Made in Germany", then it must be a German beer stein. Caveat emptor. I recently received in the mail a package of material from German steinmaker Albert Thewalt which makes it clear that all may not be as it appears when it comes to "German" steins. Apparently some German "manufacturers" have responded to low-priced foreign competition by having steins manufactured in China, shipped back to Germany where the pewter and/or incidental decoration is applied, and then labeled "Made in Germany" prior to sale. (E)s ab sofort [Armin Bay Keramik & Präsente GmbH] zu unterlassen, im Geschäftsvekehr Bierkrüge und andere Keramikgegenstande, die (im wesentlichen) in China hergestellt sind, mit dem Aufdruck oder der Einprägung oder einem anderen Zusatz mit dem Hinweis Made in Germany" oder Souvenir from Germany" oder einer vergleichbaren irreführenden Angabe über den Herkunftsort zu versehen oder versehen zu lassen, oder sonst in den Verkehr zu bringen oder Entsprechendes zu dulden[.] 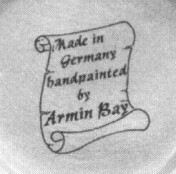 Starting immediately, [Armin Bay Keramik & Präsente GmbH] is to stop the business of affixing or imprinting beer steins and other ceramic pieces which (for the most part) have been made in China, or applying labels stating "Made in Germany" or "Souvenir of Germany" or any other comparable misleading statement about the place of origin or letting someone else apply it or otherwise bring into circulation or allowing other to do same. Similar language was also agreed to by DOMEX. That being the case, it might appear that the problem is solved and that stein purchasers in the United States have nothing to be concerned about. Wrong! 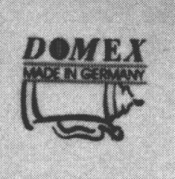 The agreements signed by Armin Bay and DOMEX have no application in the U.S. and, as things now stand, American consumers have no protection against the mislabeled steins. So how can consumers deal with the problem? Albert Thewalt suggests that the best available option is to limit purchases of new steins to those bearing the marks of German manufacturers who are known to be making their own products, and to avoid those from companies known to be outsourcing their steins to China and elsewhere. For those who would rather be safe than sorry, figure 1 shows an Armin Bay logo found on the bottom of a Chinese-made stein and figure 2 shows a DOMEX logo, also from a stein manufactured in China. Another possibility suggested by Mr. Thewalt is to look for steins that have "Made in Germany" etched or embossed into the clay, since this must be done before the stein is fired, and it is illegal to import into Germany any product which already bears words "Made in Germany". Mr. Thewalt also sent along a copy of an article from the May 21, 1999, issue of the Westerwald Zeitung that contemporary stein buyers should find of interest. Given the activities discussed above, the following translation of that article should speak for itself. SESSENBACH/HILLSCHEID. The name of the beer stein manufacturer Gerz, who went bankrupt in Sessenbach, remains preserved, however, apparently not the production. As the WZ found out yesterday, the DOMEX Geschenk-Manufaktur GmbH in Hillscheid bought the Gerz "mark". As this is written [Dec. 1999], it is my understanding that steins with "worldwide" origins and marked with the traditional Gerz logo are already beginning to reach the marketplace. Thanks to SCI members Albert Thewalt for sounding the alarm and Dagmar Rives for her help in translating his German source documents into English.